“In March 2015 after Damary’s 9th Birthday I noticed Damary’s lymph nodes behind both his ears were swollen. I took him to the GP and they said it was an infection and he was given antibiotics to take for 7 days. Seven days followed and the swelling was getting worse, and I noticed he was not as active as he used to be. He was losing weight, sleeping a lot and snoring very heavily in his sleep. The GP referred him to the hospital for a blood test, Ultra Sound, MRI scan. All the tests came back negative and they said they couldn’t find anything wrong with Damary. As a parent you know when there’s something not right with your child so l demanded that the doctors do further tests for something else. One of the tests they did was a biopsy. It showed Damary had leukaemia (Acute Lymphoblastic Leukaemia) and that was the beginning of our nightmare. Damary is a very active child, he loves karate, swimming, athletics and he’s brilliant at playing football and is currently playing for Euro Dagenham F.C, so to be told he had cancer was very devastating! 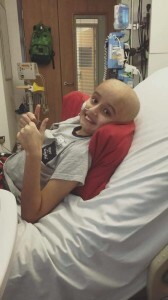 Doctors had previously said Damary’s treatment for his leukaemia would last three years, so he was due to complete chemotherapy this year. During the course of his treatment it was a very difficult time for our family but as years went by we were looking forward to the end of him receiving all the toxic drugs which was helping to treat him. 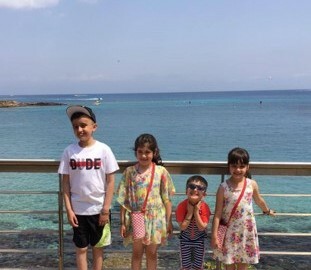 It was the best news for Damary and our family when the doctor told him that his treatment would end in July 2018 and he would be free from cancer and would be able to carry on with his life with no restrictions on what he could eat or which activities he could take part in. 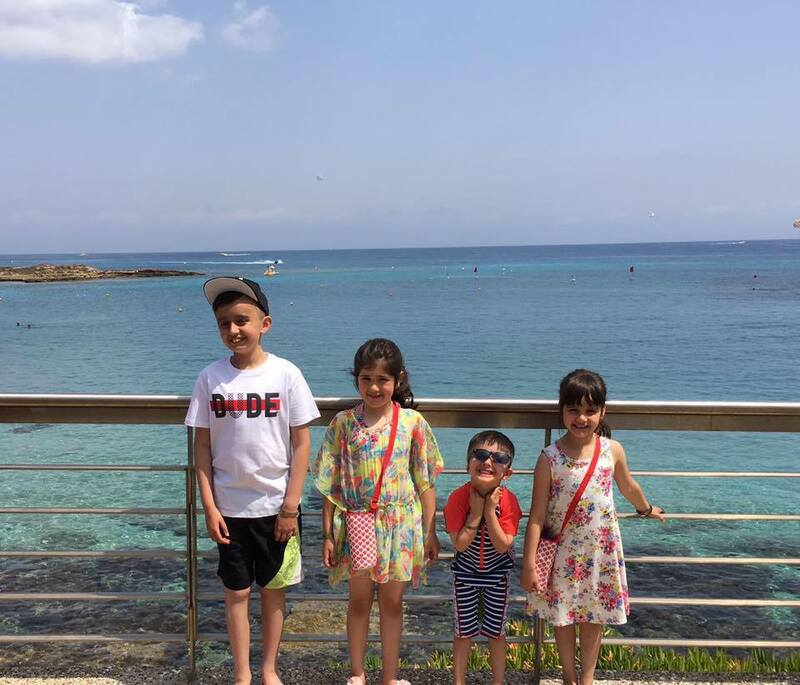 We had even booked a family holiday to Spain to celebrate the end of his treatment, and scheduled to leave on the 19th August 2018. 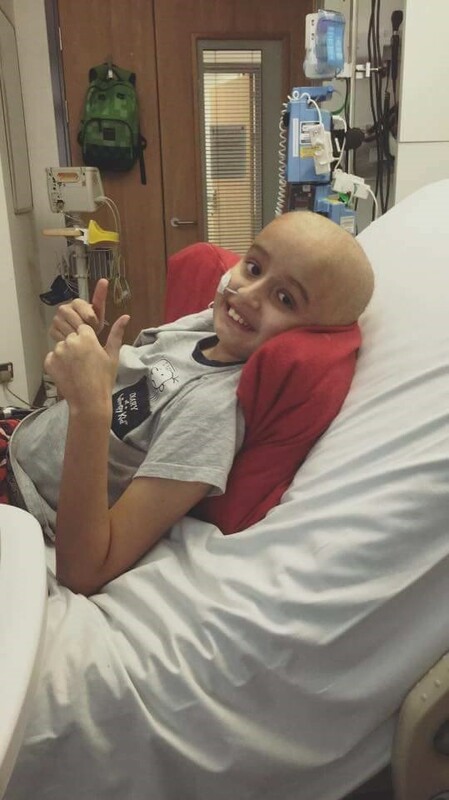 In May 2018 Damary’s blood test showed he had fallen out of remission, the leukaemia was returning which was puzzling to the doctors as Damary’s treatment should have been finishing in two months and he’s on the strongest chemotherapy there is for his leukaemia. 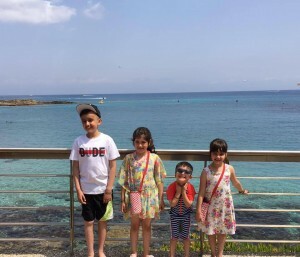 They have now recently explained to us that Damary needs an urgent bone marrow (stem cell) transplant in order to survive as the cancer came back and it’s more aggressive than before and chemotherapy alone will not work. Damary’s only chance of survival is for us to find him a matching donor. 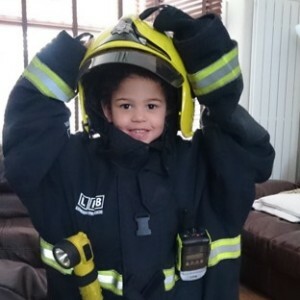 We desperately need more people of African Caribbean heritage to register as potential lifesaving donors to help young boys like Damary. Kaiya Petal, who was diagnosed with Leukaemia earlier this year, is desperately trying to find a blood stem cell match outside of the family to give her the best chance of survival. The family of Kaiya are appealing to members of the Asian community across the Warwick district to get tested to see if they could be a match for their 5-year-old daughter. If you live in the area there is a donor drive being held in Leamington which will take place on Sunday 10th June at the Community Centre at Shree Krishna Mandir at 10B High Street, Leamington from 9.30am to 5.30pm. 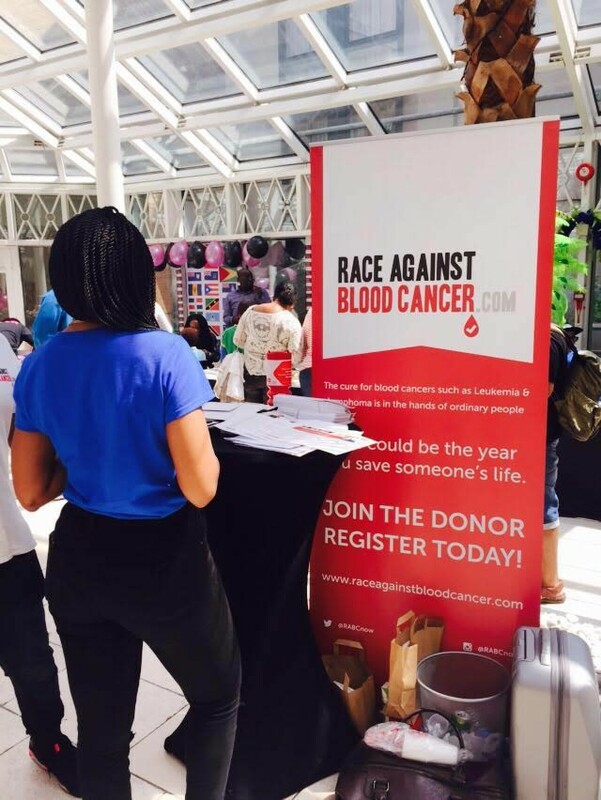 Race Against Blood Cancer is spear heading the rare mixed race bone marrow patient appeal for Khaleel Khan, a young schoolboy who is suffering from leukaemia. 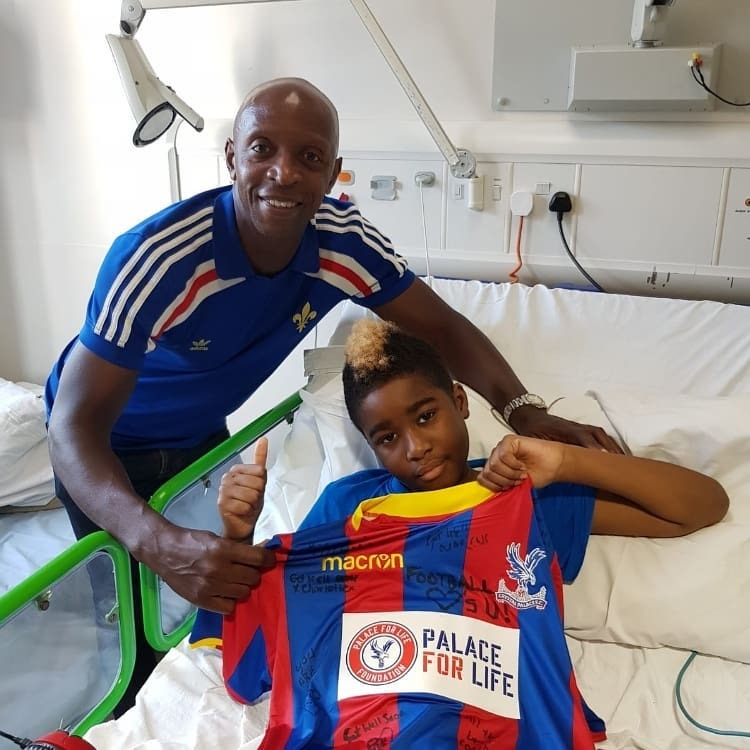 Khaleel, a 12-year-old boy from Telford, West Midlands, is currently undergoing treatment at Birmingham Children’s Hospital and desperately needs a transplant next month. His mixed English and Pakistani heritage is sadly leaving him with a very slim chance of finding a donor match. Initial signs appeared in June 2014 as he started losing his appetite and his glands began swelling on his neck. Thinking it was a throat infection as other kids had had it too, doctors at Shropdoc prescribed him with antibiotics. A few days in, he still wasn’t feeling better. Two hours later, the blood test results were back and confirmed what the doctors feared – leukaemia. 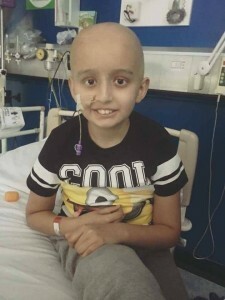 Khaleel immediately started chemotherapy and missed the whole of year five at primary school due to illness. The treatment went well though and he returned to being a young lively boy again a year later as he returned to school. He started secondary school in September 2016 and his family was looking forward to him finishing treatment in November 2017. Dr. Sarah Lawson, Birmingham Children’s Hospital’s clinical lead for stem cell transplant said: “Stem cell and bone marrow transplants form a crucial part of treatment for a number of blood cancers. 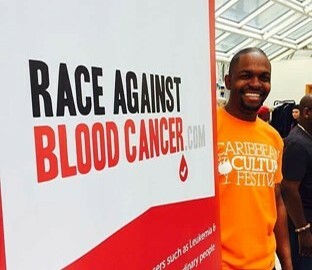 The Race Against Blood Cancer team plans to run several donor drives in the coming weeks to help find a potential lifesaving donor match for Khaleel. 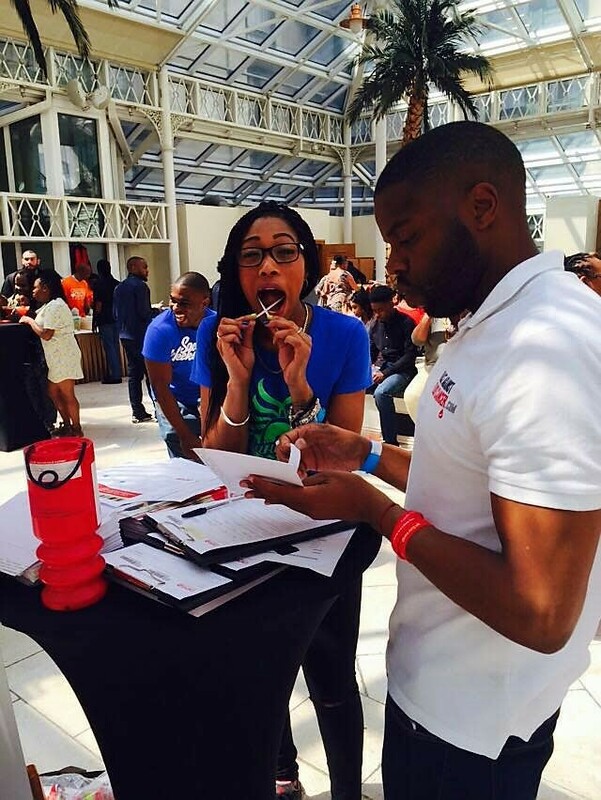 If you have not yet signed up to the stem cell and bone marrow register and would like to do so online, you can sign up here. Colourful. Fun. Informative. Educational. 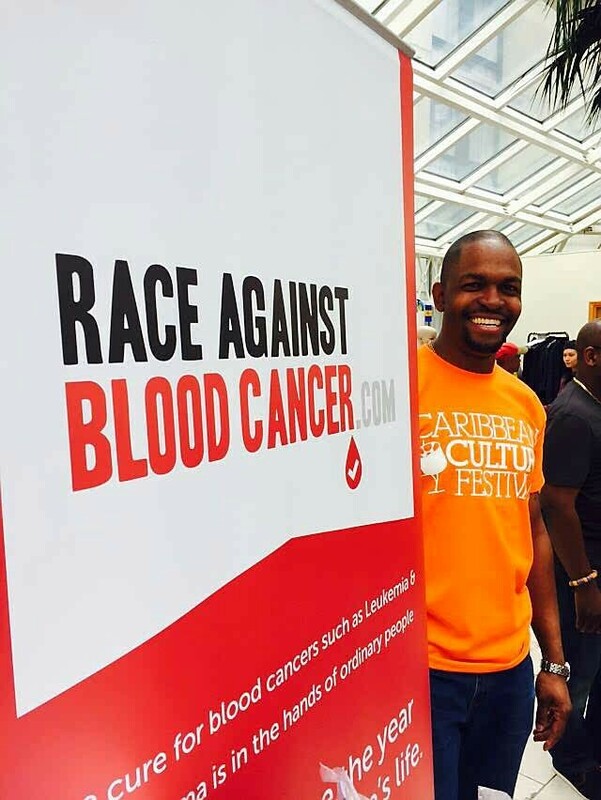 And Positive – these are the adjectives that describe the Carribbean Culture Festival that Race Against Blood Cancer attended on 3rd July. 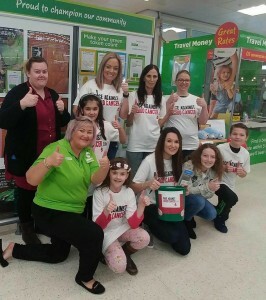 Thanks to a few connections and good words on the work that we have done so far, we were kindly invited to join the celebrations at Millennium Hotel on Gloucester Road and run a donor drive as part of the Match4Tommy campaign. The drive was a roaring success and allowed us to go home fuelled with smiles, love and energy as we managed to sign up 70 new donors to the register, what more with no prior advertising. But thanks to the captive audience, brilliant event organisers and the microphone that we were given to go on stage and talk about our work, our vision and why signing up was so important, we were able to win everyone’s hearts. 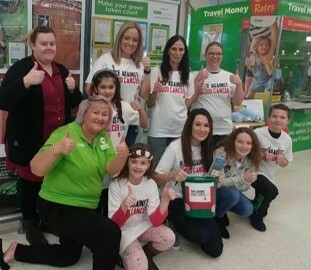 As a family friendly environment, a number of people came up to us and mentioned how they felt the Match4Tommy appeal was so important and that it was one of the contributing factors as to why they signed up. 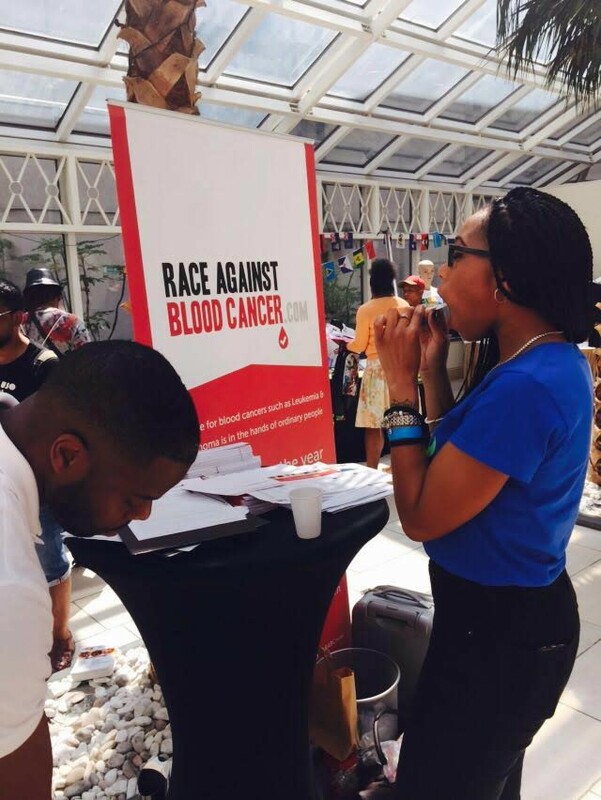 As part of the event, Race Against Blood Cancer was surrounded by great performances, brilliant food and amazing people. We can’t wait to take part in the event again next year and would like to say a massive thank you to Natasha, Eon and everyone else who helped make the day possible and supported us throughout. 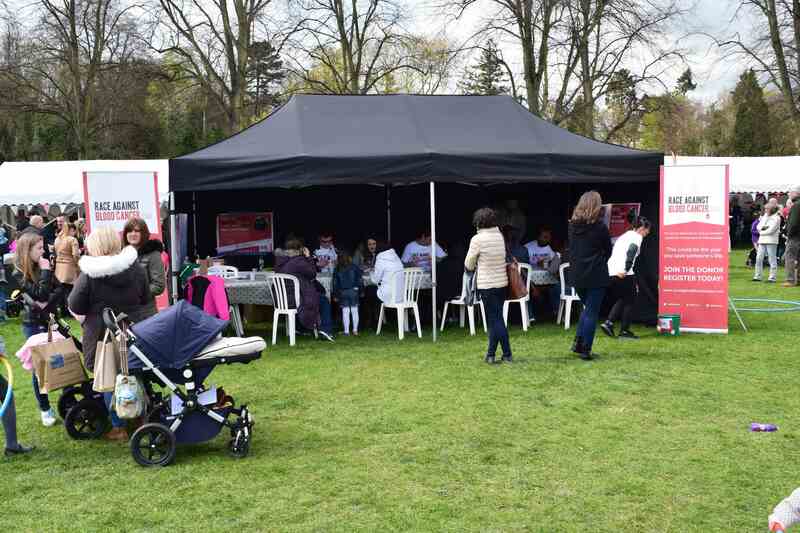 On April 23rd & 24th the Race Against Blood Cancer team joined the thousands of excited children and parents at Shrewsbury Quarry Park for our first appearance at Shropshire Kids Festival. 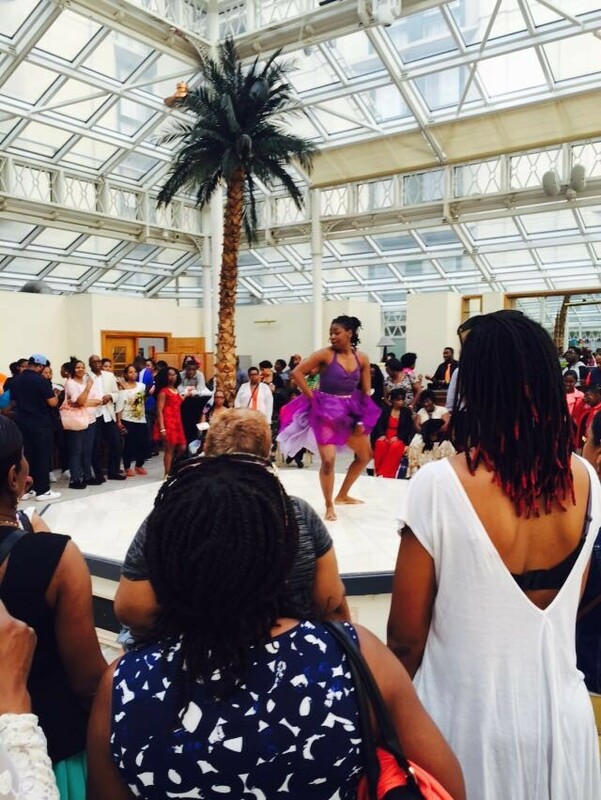 The basic yet incredibly worthwhile concept is bringing fun activities for under 14’s into one place and with more than 100 activities to get involved in, the festival did not disappoint. 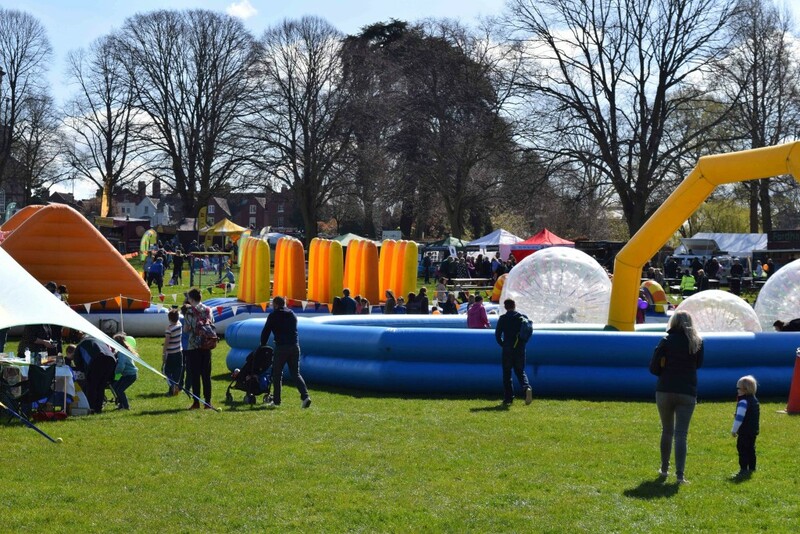 From donkey rides, face painting, to an inflatable Helter Skelter, there was something to keep every child entertained and that bought thousands of families together for a fun filled weekend. 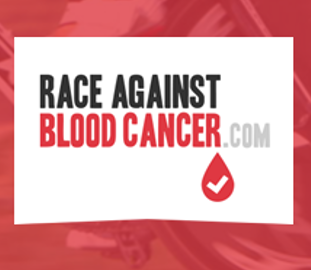 Race Against Blood Cancer pitched up with a huge gazebo with both an energetic and passionate team. Following the family and children theme, the team was made up of volunteers from both London and local Salopians, parents and kids a like. The team enjoyed the frequent sunny spells and luckily the less frequent showers. 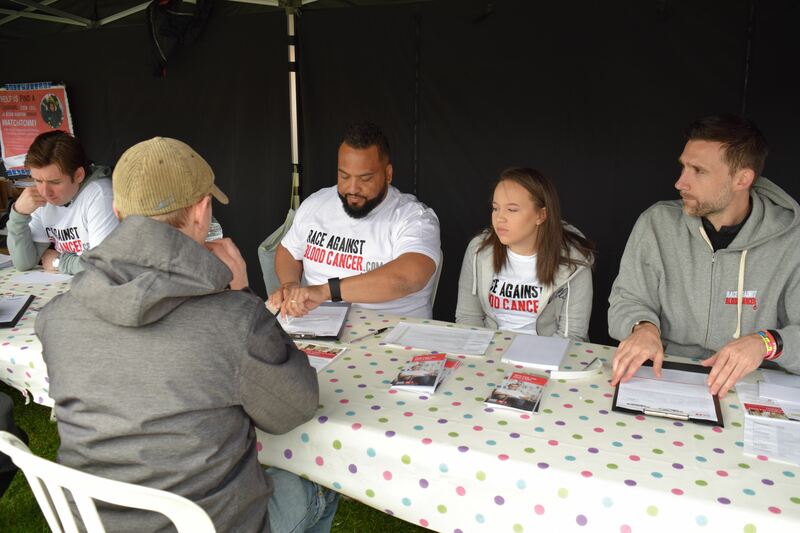 Running around the festival speaking to anyone that would listen, raising awareness and signing up the much needed bone marrow and stem cell donors, the team was in full flow. In working in partnership with the #match4tommy campaign we hoped for a great turn out and we weren’t disappointed! By the end of the two days and an amazing effort by the whole team, we managed to collect 200 new donors! This was an amazing outcome and an event we all thoroughly enjoyed. 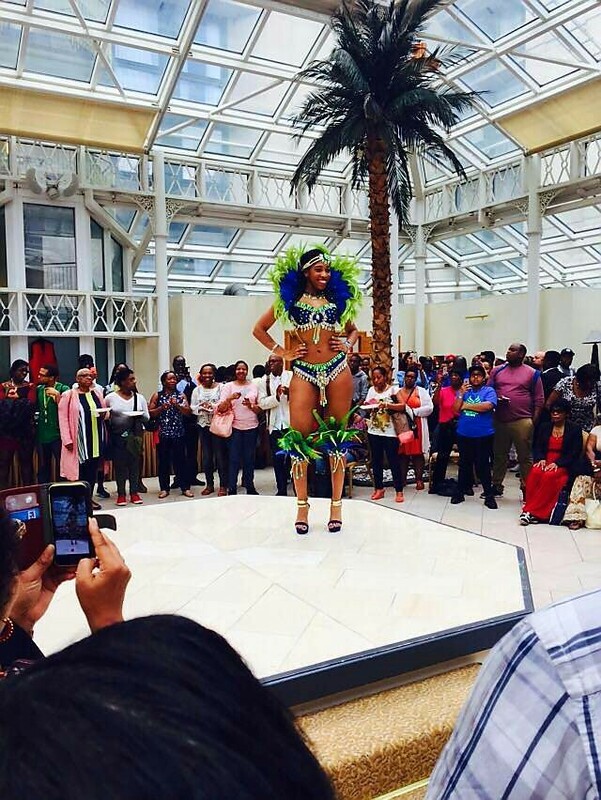 The atmosphere was buzzing throughout and we are extremely grateful for the opportunity to attend. A huge thanks goes to out to Beth Heath, Rachel Davy, Emma Davies, along with all of those who came down and helped out. Lastly and most importantly, thank you to all the kind donors we signed up on the day. We hope you continue to share our hopes and dreams of finding the likes of Tommy and every blood cancer patient a lifesaving donor match. Another busy weekend is lined up for us as we will be heading to Kids Fest in Shrewsbury on 23rd/24th April. 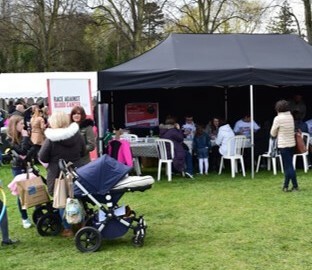 It will be a very busy weekend for our Race Against Blood Cancer engagement team who will be at Shropshire Kids Fest on Saturday 23rd and Sunday 24th April. 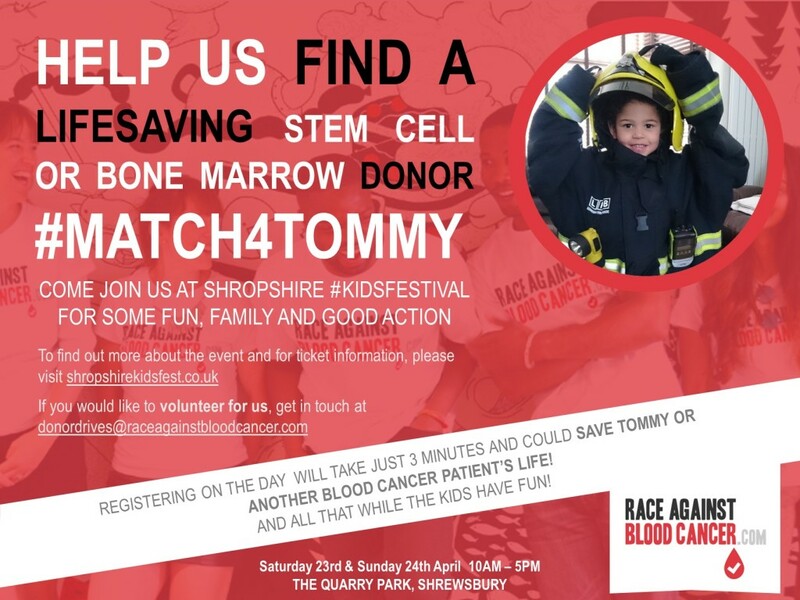 With entertainment for kids of all ages, it will be a great opportunity for us to raise awareness for the #Match4Tommy campaign which started when 4 year old Tommy was diagnosed with Acute Myeloid Leukemia in January this year. Crowds of over 10,000 people, including children of all ages, are expected over the course of the two day event with many activities to keep the kids busy while the parents and teenagers from ages of 16+ take 5 minutes to sign up as new stem cell and bone marrow donors. Follow us on social media and stay tuned for news, photos and updates throughout the event!